Apartment-living, like anything in life, comes with its own set of pros and cons. Con: the walls are so thin you can hear your next door neighbors breathing. Pro: when the 20-year-old fridge in your kitchen inevitably breaks, you're not the one who has to replace it! I've been living in rentals for about eight years now, and while one day I'd like to buy a little fixer-upper of my own, for now I'm figuring out how to enjoy the temporary spaces I inhabit. Here are a few tricks I've learned that can help you put your own mark on your apartment. Bonus - everything is reversible, so you don't have to worry about a disgruntled landlord! An easy way to add your personality to your rental kitchen is to change the cabinet knobs. Generally speaking, all of the hardware in an apartment is going to be cheap, which usually equates to it being ugly. Switching drawer pulls and cabinet knobs is as simple as using a screwdriver, and as long as you put everything back when you move out, it's landlord-friendly. If your cabinetry has two-hole pulls like the ones seen above, measure the distance between the holes before heading to the hardware store to purchase new handles. When switching out your cabinet's hardware, make sure to keep the original handles and their accompanying screws. Store all the pieces together in a clearly labeled sandwich bag until you move out. Nothing screams "temporary living situation!" like standard cheap-o window blinds. To make your apartment feel more like a home, replace cheap blinds with roman shades (like the one seen above). Like with the cabinets, don't forget to keep track of all the original window treatment hardware so you can put everything back when your lease is up. If you're unable to remove the original blinds, try covering them with unique and bold curtain panels. If you're feeling extra crafty, see how to make your own curtains like the ones seen above using a flat sheet, stencils, and paint! As a renter, contact paper is my saving grace. Peel-and-stick contact paper (also called shelf liner) is a cheap, temporary solution to many a renter's problem. If I don't like the look of a surface in my apartment, I will inevitably attempt to cover it in contact paper. If you aren't feeling the plain style of your home's outlet covers, you can painlessly upgrade them in a matter of minutes. Before applying contact paper, unscrew the light switch plate from the wall. Cut a piece of contact paper large enough to cover the face and sides of the plate. Stick the contact paper to the plate, smoothing out any bubbles as you go. Cut a small slit at each corner, and fold all the sides down. Trim any excess paper, then cut an opening for the light switch and screws with a craft knife. Almost every apartment that I've lived has had the same stark, white walls (with the exception of a home I lived in that had floor-to-ceiling wood paneling from the 70s - yikes!). Clean, negative space is nice on the eyes, but only to a point. Hanging your own curated collection of wall art is the easiest way to claim a space as your own. Even if your landlord is okay with nails in the drywall, do yourself a favor and hang artwork with non-damaging adhesives. Using more temporary methods, like Command Strips, means you can change your mind and rearrange your wall art when the urge strikes. My favorite to use are the velcro-backed kind, as they can be adjusted and straightened again and again. I just recently started bringing house plants into my apartment, and I have to say it's made a striking different in how the space feels. Sometimes it can be hard to combat the cookie-cutter feel that accompanies pre-fab spaces, but a single pop of green can quickly liven up an entire room. In the world of rentals, plants are a major game-changer. Share these apartment ideas on Pinterest! Do you have any tricks for putting your own personal stamp on a temporary space, while keeping your landlord happy? Let me know in the comments! Check out these gorgeous tiny homes and apartments for more small-space inspiration! I've used the Velcro command strips and when I pulled my pictures off the walls the strips came too with chunks of sheetrock. It's happened several times. The last straw for me was when it happened at my last job. Thankfully I didn't get in trouble. @Eloise These are great tips! It's amazing how much adding bold color can totally transform a space. Ditto on the contact paper bathroom idea - too humid! I once wallpapered a whole bathroom in Contact(r) paper. Don't. Love the plants idea; it really does make a diff and cleans the air, too. I'd use larger swaths of color on the walls from a lightweight bedspread, throw or sheet in sophisticated colors: also hangable with temporary hooks. Just sew a loop in the top two corners and maybe the top middle, on the back of the fabric. Fancy gift wrap like William Morris or Marimekko prints work, too; big swaths of great color and designs for cheap. Color makes the most difference the fastest, so pick a three-color scheme you love and show it. I collect lone, colorful fabric placemats and dinner napkins and high-end fabric remnants that all sell for next to nothing. Put 'em on ugly countertops, hand-me-down end tables, etc. 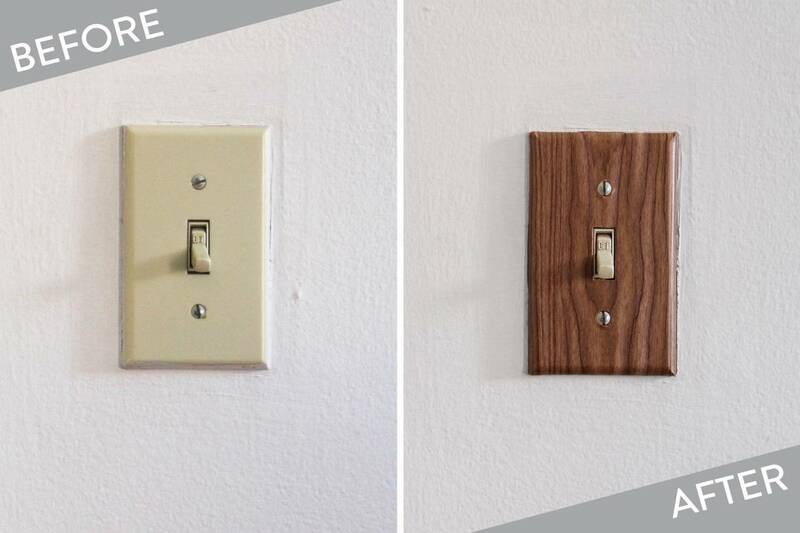 23 DIY Switch Plate and Outlet Cover Tutorials.